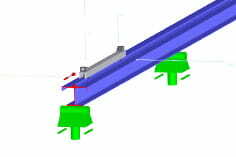 If a crane runway has a small cantilever beam at the beginning and end, so that the runners reach the support, the deformations in these areas show impermissible values. What should I do? guided. It can not be distinguished by the program whether the proof for the crane runway carrier to be verified is meaningless or not. This decision must be made by the engineer. Usually, the examiner is given a simple indication in the statics. Alternatively, one could also decide whether such a carrier for the design of the entire crane runway carrier is ever relevant and neglected when entering the geometry.